In the prior post, I played with putting together little boxes that perform actions on numbers coming in – simple actions like adding two – and reported on an experiment with seventh graders to find equivalent boxes. I’m going to put the experiment with seventh graders aside for now, and continue to play with the little boxes myself. At some point, we’ll have to expand the repertory of boxes to include some that can take two separate inputs, but for now we’ll stick to boxes that take a single number as their input, and produce a single number as their output. Since in this post I intend to string together lots of these boxes, I’m going to change my normal habit of putting one above the other, and instead string them together sideways. In the figure above, the left side (a) and the right side (b) are meant to depict a variation on the very same idea: some number goes in, you first add 2 to it, then add 3, and the resulting number comes out. At this point, it may feel like we’re stuck – that we can reduce the number of cars in the train no further. But this isn’t really the case, it is just that we need other tools than the ones we’ve used so far. 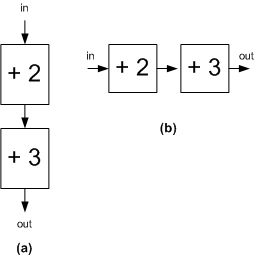 When we have a pair where the first operator adds or subtracts, and the later operator multiplies or divides, we can find an equivalent pair in which the order of the operators is reversed. But the equivalent pair won’t have the same numbers as the original. In the example above, +3 followed by × 6 has the same overall effect as × 6 followed by + 18. Here, the + 18 reflects the insight that the × 6 in the figure on the left didn’t merely operate on the number coming in, but also operated on the 3 that got added to that original number. Here, too, we have alternating addition/subtraction operators and multiplication/division operators. As before, we can take a pair that starts with an addition or subtraction, and reorder the operators while changing the numbers appropriately so that the two pairs behave in the same way. Here, adding 8 and then dividing by 4 has the same effect as first dividing by 4 and then adding 2. The approach sketched above suggests that any train of cars – where the cars add something, subtract something, multiply something or divide something – can be shortened to no more than two cars. Is this really so? Might there be some “gotchas” that our breezy exposition may have overlooked? Are there interesting conclusions that can be drawn from our purported result of always being able to reduce a train to two cars (or less)? We will look at those questions in the next post of this series.